Taekwondo Bonsais is a martial arts program for children ages 4 to 6. 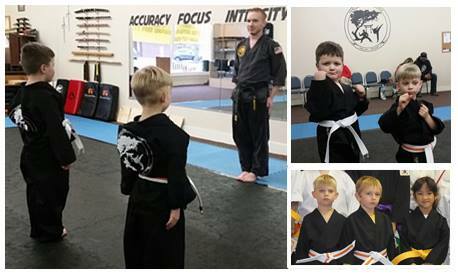 Students in our Bonsais program learn Taekwondo, Karate and self-defense techniques designed to prepare them for entry into the Kicks for Kids™ program (ages 6-9). Classes are offered each Tuesday and Thursday from 4:00 pm til 4:30 pm at our Dallas, Oregon gym (dojang). We’re conveniently located at 145 SW Mill Street in downtown Dallas (across from the Post Office). Look for the yellow Taekwondo high kick logo on our window. We always offer 1 week free lessons so you can try it out and see if your children enjoy and benefit from the program. Our students have a great time while improving their fitness and gaining traits to benefit them throughout life. Aside from fitness, discipline and self-confidence, students learn the five tenets of Taekwondo. 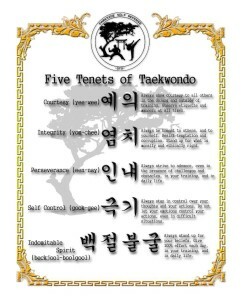 The 5 Tenets of Taekwondo are recited at the beginning and end of each class. It is important that students understand these five tenets, and the characteristics one must possess, if he or she is to become a true student of Taekwondo. Courtesy 여의 (Ye-Ui, pronounced yee-wee). Always show courtesy to all others in the dojang and outside of training. Observe etiquette and manners at all times. Integrity 염치 (Yom-Chi, pronounced yom-chee) Always be honest to others, and to yourself. Resist temptation and corruption. Stand up for what is morally and ethically right. Perseverance 인냬 (In-Nae, pronounced een-nay) Always strive to advance, even in the presence of challenges and obstacles, in your training, and in daily life. Self Control 극기 (Guk-Gi, pronounced gook-gee) Always stay in control over your thoughts and your actions. Do not let your emotions control your actions, even in difficult situations. Indomitable Spirit 백절불굴 (Baekjul-Bool Gool, pronounced beckjool boolgool) Always stand up for your beliefs. Give 100% effort each day, in your training, and in daily life. These 5 Tenets of Taekwondo are a guide for the student’s behavior in the dojang, and in all other areas of life. 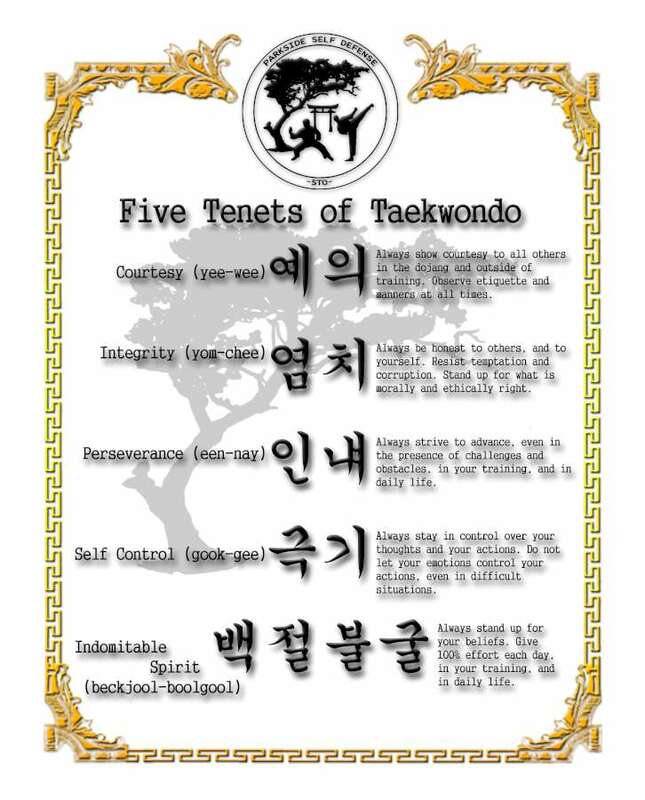 Students of Taekwondo build character through repetition and memorization of these tenets. The tenets are an integral part of our daily training and we encourage all Taekwondo students to take the time to think about how they will apply these tenets to their daily lives. All professional photographs on this site are used with permission of StrikingImage.com. We highly recommend Striking Image for your martial arts photography.